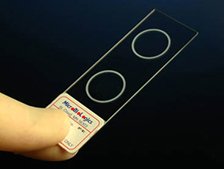 Our Staining Control Slides are microscope slide preparations containing specific organism populations with known and predictable characteristics. 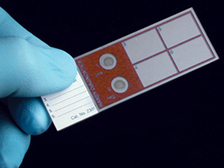 These slides support formal quality assurance programs by serving as quality control challenges to verify performance of stain reagents, staining methods, and the performance of personnel interpreting microscopic examinations. This quality control slide provides two air-dried and methanol-fixed droplets within two etched circles. 10 per box. See table below for range. A convenient ready-to-stain control slide that will test both your stain solutions and your staining techniques. Positive and negative stain control organisms are affixed to the circles in each Q-Slide™. Up to four patient specimens (in the squares) may be processed at the same time as the QC organisms. 10 per box. See table below for range.